Hi there!! Welcome to Mrs. Lincoln's Inkin' and my Color Coach Week. 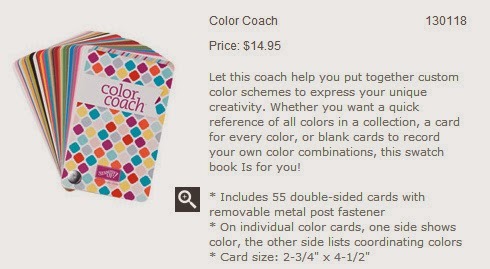 All this week i have been showcasing card that i have made using colors from the Color Coach. The colors that i used today were Sahara Sand, Pear Pizzazz, and Early Espresso. The base of my card is where i used the Early Espresso. I did my card a little different today and i cut the top flap in half so that i only covered half of the bottom portion. I didn't want my top flap to just be bare so i stamped out flowers from the Flower Shop stamp set in the Crumb Cake and then punched them out with the coordinating Pansy Punch. This is one of my favorite bundles which you can see by clicking HERE. To make them more 3D, we all know how much i LOVE dimension haha, i added another flower using the Petite Petals stamp set (again in the Crumb Cake ink) along with the coordinating Petite Petal Punch, another great bundle, which you can see HERE. To finish off the top flap and to use the third color on my Color Coach card, i took my Pear Pizzazz 3/8" Taffeta Ribbon and tied it around. The stamp set that i used today for my sentiment is the Delightful Dozen set, which is also the set that i am showcasing today. Click on the picture above to be taken to my on-line store to see all the details about today's featured stamp set.